Positano Place Condos: Solid concrete walls, very quiet and strong. Largest two bedroom unit in complex with area called solarium that can be an office, or play area. Third floor, near elevator, crown molding, granite in kitchen, baths and computer station. Excellent clubhouse facilities. Kids play ground, car wash area. close to I-75. Annual tenant in place. Positano Place Condos: Beautiful interiors, freshly painted, new appliances and outstanding Naples School district! Currently, the lowest priced three bedroom residence at Positano Place, this is a must see. Granite surfaces in kitchen and baths, wooden cabinets, stainless steel appliances, diagonal tile in great room and dining area and attractive sunny southern facing lanai. You will love the nearby oversized resort-style pool, hot tub spa, clubhouse, fitness center and children’s outdoor play area. This three bedroom, two bath makes a fantastic full-time home, winter seasonal residence or investment property. Vacant and ready for immediate occupancy, schedule a showing today. Positano Place Condos: Welcome to Positano Place a gated community located in the heart of Naples with close proximity to the white sand beaches, shopping, dining, and farmers markets! This open and bright first floor residence is very private and boasts two large master suites with attached baths and large walk-in closets. The property has been upgraded to feature granite countertops, stainless steel appliances, 18-inch tile floors, and nine-foot ceilings. Current Price INCLUDES ATTACHED single car garage for convenient, direct covered access to home with additional assigned parking space! Washer and dryer are included. Positano Place offers a resort style pool overlooking the lake, clubhouse with billiards and media room, executive business center, a state-of-the-art fitness center, car care facility, and playground. Positano Place Condos: Don’t miss this Lowest Priced 3/2 residence in Positano! A lovely kitchen awaits a new owner with custom tile backsplash and tile on wall below breakfast bar, walk-in pantry with built in granite shelving perfect for storing small appliances, cookware etc. A built in cocktail bar off living room is perfect for Happy Hour. Imagine entertaining while cooking on a newer Kitchen Aid stove with a built in Warming Drawer, and loading dishes in the Viking Dishwasher! All kitchen appliances are Stainless Steel. An extra bonus is the large storage room with shelving to store beach chairs, umbrellas, tools, etc.. a wall hook for your bicycle is included. Let the Florida fun begin! A short walk to the clubhouse, fitness center, pool and barbeque grills. In season, enjoy a social calendar with Mah Jong, Water Aerobics, Book Club, Ice Cream Socials, etc.. (depending what activities the social committee schedules that season). And did I mention the playground! Satellite Dish available with this unit. Positano is great place to live, whether full time or seasonal. Live the Neopolitan Dream for a great value! Positano Place Condos: Move right into easy-living in this light and bright, well-maintained condo located just minutes to I-75. This cozy unit is on the top floor of a quiet building (with an elevator) located at the back of Positano Place and away from Livingston Road. Condo features stainless appliances, granite counters, lots of windows, a built-in desk and laundry in residence. The Positano Place Community Center offers a 6,800 sq. ft. clubhouse with game/media rooms. There is also a well-equipped fitness facility featuring a weight room, treadmills, recumbent bicycles, cardio and strength-training equipment. Last, but not least, Positano Place is only 4.4 miles to the beach! The Naples lifestyle at a super-affordable price is right here waiting for you! Positano Place Condos: This top floor wonderful Verona-style condo features two bedrooms and great living room extended with an screened lanai. Modern and well-maintained, New AC ,New carpet ,the residence includes newer stainless steel appliances, granite countertops, raised panel cabinetry and a full-size washer and dryer. 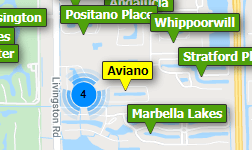 Positano Place is a gated and patrolled community located in central Naples, near Pine Ridge and Livingston. Positano Place has one of the finest resort-style swimming pools, spa and fitness facilities in Naples. There is also a clubhouse with kitchen areas, business center, wifi, game room, on-site property manager and more. Owners will enjoy the great location with convenient sidewalks for recreational use in this pet-friendly community. Positano Place Condos: Private Southern view from this Condo ready for immediate occupancy. Second floor 2BR/2BA with a great floor plan, two master bedrooms w/large closets, light and bright western exposure, and a granite topped computer alcove. Upgraded with granite counter tops, wood cabinets, and stainless appliances. New A/C unit. Washer and dryer are included. Convenient location on Livingston Road west of I-75 just south of Pine Ridge Road. Positano Place is in the center of town convenient to shopping, beach and dining. The community offers a resort style clubhouse and pool with billiards, a business center, a fitness center, car wash, and playground. Positano Place Condos: Desirable view and features for affordable seasonal or year round living. Come enjoy Naples' dazzling sunsets from this screened lanai with a lake/fountain/pool-clubhouse view! Move-in ready, turnkey furnished with available inventory for review. Association fees are only $805/quarter. Positano Place is a gated and patrolled community located in desirable central Naples with proximity to many local points of interest & local amenities, and is approximately 4.5 miles from Clam Pass Beach. The community offers common elevator equipped buildings, luxury resort-style amenities including heated pool/spa, clubhouse with fitness center, business center, game room, media room, two catering kitchens, large social/gathering area, and vehicle wash area. Balance of HomeTech Gold Service home warranty conveys! Bring offer! Positano Place Condos: ***MOTIVATED SELLER**BRING ALL OFFERS*** Beautifully updated condo in the Positano community. This third floor condo has a light airy feel and amazing lake views. Modern and well-maintained, the residence includes updated appliances, granite countertops, raised panel cabinetry and a full-size washer and dryer. Light neutral tile was replaced three years ago. The water heater and the AC are all new as well. The community offers common elevator equipped buildings, luxury resort-style amenities including heated pool/spa, clubhouse with a fitness center, business center, game room, media room, catering kitchens, large social area and a vehicle wash station. Convenient location on Livingston Road west of I-75 just south of Pine Ridge Road. Positano Place is in the center of town convenient to shopping, beach and dining. Positano Place Condos: Move-in ready, this top floor, 1bedroom plus solarium, versatile Pompeii floor plan lives large! New AC, stacked washer/dryer, stainless steel appliances, built-in desk alcove, large tile & crown molding in main living area, wood laminate floor in bedroom with generous size walk-in closet. Convenient pass-through bath offers garden tub & shower. Affordable living in this pet-friendly, gated and patrolled central Naples location W of I-75. Positano Place has resort-style amenities (WiFi clubhouse with game room, business center, fitness center,media room, 2 catering kitchens, large screened lanai) heated pool/spa, tot lot, bocce ball, car wash area), with proximity to many local amenities, points of interest and only 4.5 miles to Clam Pass Beach. No CDD or MSTU, common elevator building, water/sewer & county trash collection included in quarterly fees with reserves. Outstanding opportunity for enjoying the Naples lifestyle! Need professional assistance selling your property at Positano Place Naples? Find out how an Area Specialist can help to generate more property exposure in order to get the most money for your investment in the least amount of time.